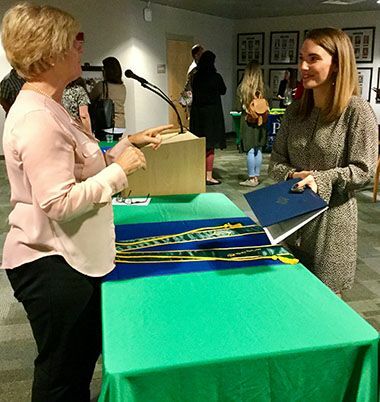 Fifteen Pensacola State students were inducted into Sigma Beta Delta international honor society this fall. Carly Marie Brink, Ashley Gail Carroll, Thao T. Dang, Victoria Elaine Greene, Bryan Patrick Kelly, Kelly Marie McCowan, Deborah V. McIntyre, Elizabeth Ashley Medeiros, Andrew M. Merchel, Erica Otten, Joseph Santo Russo, Amanda Satterwhite Sears, Kelly Klugh Trimmell, Troy Watts and Katherine Williams were inducted into the society for business, management and administration majors during a ceremony held Monday, Dec. 3, at Chadbourne Library. Ten of the 15 inductees attended the ceremony. Dr. Ed Meadows, Pensacola State College president, congratulated the inductees on their accomplishments. 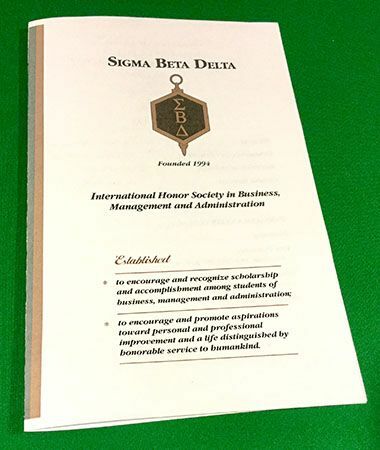 Sigma Beta Delta’s mission is to encourage and recognize scholarship and accomplishment among students of business, management and administration, and to encourage and promote aspirations toward personal and professional improvement and a life distinguished by honorable service to humankind. The honor society officers are Barbara Rodriguez, president; Sarah Lewis, vice president; and Bill Fitzgerald, historian.